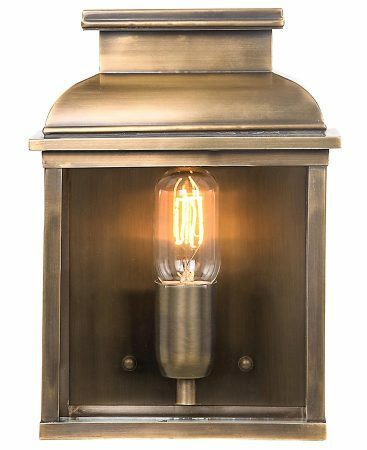 This Elstead Old Bailey 1 light solid brass outdoor wall lantern is rated IP44 and handmade using original designs dating from the pre-Georgian era. Part of the Olde England collection of garden lights, crafted from solid brass and tarnished to create an antique finish. Flush to the wall mount, with curved domed lid featuring a full width top gallery, clear glass panels and hinged front door for easy lamp replacement. The solid brass back plate gives a warm and inviting reflective light from the single lamp bulb. Shown here fitted with a vintage filament lamp that is not included but can be purchased separately by following this link. There is a larger 2 light version of this stunning lantern available, please see below. This exterior light is supplied by Elstead Lighting, a British company that specialise in the manufacture and distribution of quality decorative lighting such as the Old Bailey 1 light solid brass outdoor wall lantern rated IP44 you see here.